AO is at it again. This time, it is an art piece of third baseman Mike “Moose” Moustakas. With a great appreciate for the hot corner, AO has great respect for the player that takes that position, guards the line, watches for the bunt, turns two and knocks down or snags every hot shot that tries to get by. But to combine defense and offense is a huge blessing to a ball team and that is what Moose brings to the “K” on a regular basis now. 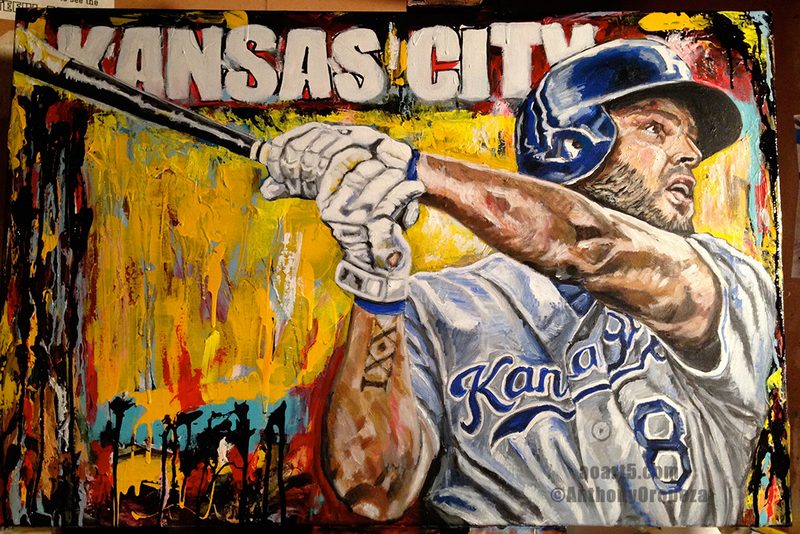 AO’s passion for baseball and the Royals since the late 70’s has made this piece something special and original. Although AO’s favorite ballplayer of all time is George Brett (and it is the reason for the “5” in AOART5), moose has done a fantastic job handling the hot corner. Now, Oropeza honors Moose as he continues the his “Royals Series of 5” with the Moustakas at bat as his third piece of art of five. The work is a 3ft x 2ft mixed media, mostly acrylic in canvas. The other Royals ball players on the list in the series are Lorenzo Cain, Eric Housmer, Alex Gordon and Salvador Perez. Third baseman for the Kansas City Royals of Major League Baseball (MLB). Mike was drafted second overall in the 2007 MLB Draft by the Royals. Moustakas should be the Royals come-back player of the year in 2014. On May 22, 2014, he was demoted to Triple-A Omaha after batting just .152 through 139 plate appearances, though he led the team in homers with 4. On June 1, Moustakas was recalled from AAA. He began to hit more consistently after this. He finished the season batting .212, while hitting 15 homers and driving in 54 runs. Moustakas tore through the 2014 Playoffs, hitting 5 homeruns, including a go-ahead solo shot in the 11th inning of game 1 against the Los Angeles Angels of Anaheim. He led all 2014 Postseason players in homers. In 2015, Moustakas carried over his success from the postseason and had a batting average at or above .300 right up until the All-Star break. He was selected to the 2015 All-Star Game via the All-Star Game Final Vote. Moustakas was placed on the family emergency list twice during the first half of the 2015 season. Without the strong play of Moose and many of his teammates, the Kansas City Royals would have had a tougher time making the World Series.